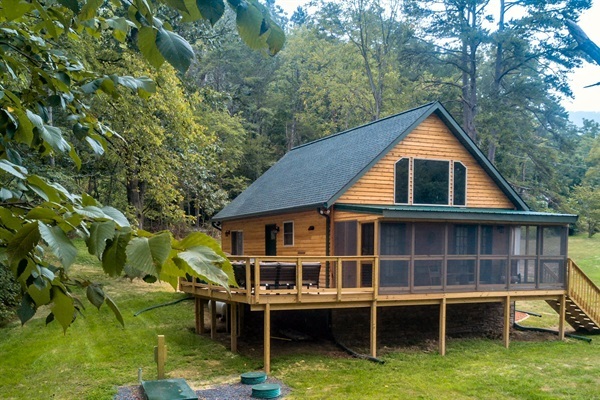 Recently built (finished in August 2017), this river-access cabin is built for couples or small families. Heaven's Hideaway was designed to be open and roomy while feeling warm and personal at the same time. Just look at the pictures and you'll instantly be hooked! On the outside, there is access to the river - you can hear the water from the cabin! - with plenty of yard space for relaxing or exploring nature. There is also a beautiful roomy deck with a new, modern hot tub, a gas grill and ample sitting room. The sitting area of the deck has a gas fireplace for added warmth. Too many pests at night? There is also a large screened-in porch where you can sip wine and talk for hours. On the inside, Heaven's Hideaway is filled end to end with warm rustic touches in every room. The full kitchen (including dishwasher) has modern appliances, an apron sink, beautiful colors and an island for added counter space. The sitting area is large and roomy. The bedrooms, the loft, the bathroom - you will love every room! Rainy day? We have a game room with bunches of board games! Sit by the picture windows with some coffee and a book.